There are many places to swim with dolphins in Florida. Three of the main locations within Florida are Orlando, Miami, and the Florida Keys.The very popular location of Orlando, where you are offered the all inclusive style package that covers not only the dolphin swim and several other amenities, such as snorkeling with tropical fish and unlimited buffet of food. In Miami, the dolphin odyssey program, includes, the dolphin swim, full access to the facility, and other marine animal shows. Last but not least, the Florida Keys, there are many places you can swim with the dolphins here. 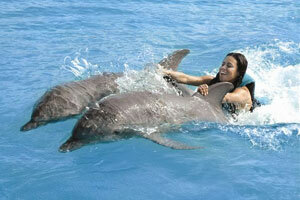 You can find a program where you swim with the dolphins by itself or a complete package with other activities. To swim with dolphins in Florida is such a majestic and whimsical thought, to put your troubles and worries aside, to really just let loose, experience the joy and embrace of such a beautiful creature. Surely there is no price to embody such a feeling. There are many locations to do this in Florida, such as Miami, Orlando, Central Florida, the Panhandle, and the Florida Keys. Each is unique in their own right. Miami, Orlando, and the Panhandle area are very similar that they have a dolphin interaction experience and marine animal shows within the same facility. Or the Florida Keys and Central Florida, where these facilities have the dolphin interactions only and no other amenities. Each facilities has it unique differences. You need to discover which one is best for you and your family or friends. Make sure to click each facility TAB and discover why Florida is the Swim with the Dolphin Capital of the World!! Copyright © 2018 : www.DolphinPlaces.com. All Rights Reserved.